Has anyone had any experience using a hyperstar lens on a Schmidt Cassegrain telescope? Are they difficult to use, are the results good? Any information would be gratefully received. I've not got one but I have looked into it since I have a fastar capable SCT. The accessory is costly, circa £800, and is specific to the type of SCT that you fit it to. Definitely, not sensible on an 8" tube unless you have a barrel CCD to use with it. Even then the optics are apparently not ideal which is why the next size up is 9.25". Judging by how the price of the hyperstar increases for the 11" and then again for the 14" tubes I guess that it probably delivers a better result. For that sort of money you could buy a completely different imaging solution that is far less bespoke though. Someone on the Telescopes Forum has one fitted to a 14" SCT. 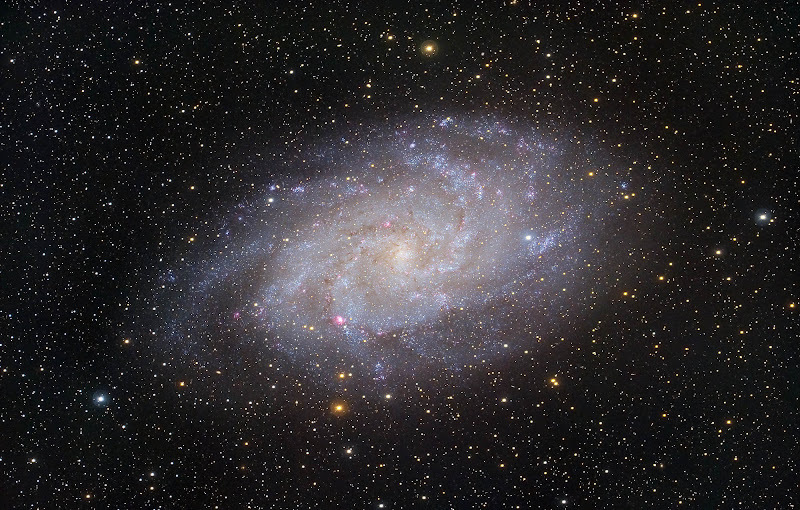 They've posted this image of M33, which looks OK I suppose, but from a £10,000 telescope I'd expect something OK. There's a lot of light spread from the brighter stars that I'd not be happy with - but maybe that's just me. Can you upload the picture here? The link you gave is to a members only site. Even so, unless you already have the F10 SCT and want to convert it into an astrograph, you'd be better off buying a proper astrograph or a better mount and guider for longer exposure time with a smaller 'scope. I see what you mean regarding the halos. Might be some sort of diffraction pattern as there are some brighter radiant lines inside the halos. Did they say what camera was used with the Hyperstar? Otherwise the picture looks impressive, although image post processing can work wonders these days. But as you say, for a 10 grand 'scope you'd expect at least this standard! dave.b wrote: Did they say what camera was used with the Hyperstar? The sig under his post suggests it's a QHY10. Well that's a nice barrel shaped camera to use with a Hyperstar! There should be just the lead crossing the field of view and that shouldn't affect the image.